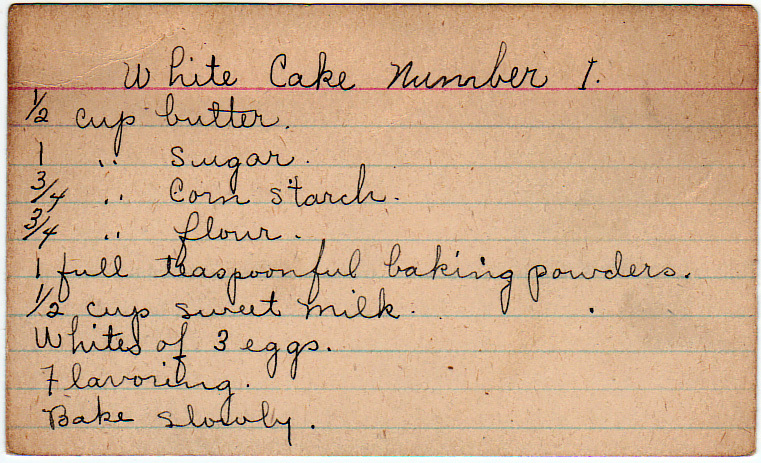 Cornstarch in cakes–now there’s a technique your great-grandmother used. Usually, you would replace two tablespoons of regular flour with two tablespoons of cornstarch to approximate cake flour. It lowers the protein content of the flour so it develops less gluten. “Householders who can do so are asked to give up all use of wheat products from now until the new harvest which comes in August. This covers not only white flour but also Graham flour, whole wheat flour, wheat breakfast cereals, macaroni, noodles, spaghetti, vermicelli, and all crackers, bread, pastry, cakes, doughnuts, etc., containing any wheat flour. “Householders who have hitherto baked at home and are able to carry out this request will not begin now to buy breads of bakers. “To do that would defeat the purpose of the present request. Bakers’ bread is necessary for the subsistence of a part of the community and should be left exclusively to that part. “Bakers have to use a conserable portion of wheat flour because their bread must be durable. “America as a whole must cut her wheat consumption in half and more than half. From 42,000,000 bushels a month she must cut her consumption to 20,000,000. To accomplish this each American must cut his individual consumption to 6 pounds a month. 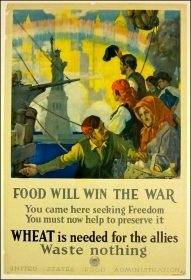 Out of the limited stocks in the country we must save our stocks for seed, some 80,000,000, we must retain a safety carry-over, we must feed our own citizens, and the United States with Canada must send to the Allies 40,000,000 bushels of wheat a month. While some bakers opted for totally wheat-free options, like barley or rice flour, for company, the 50/50 cornstarch cake was a more pleasant option. (Bear in mind, of course, that cornstarch is heavier than flour, so by weight, this is actually a 55.56%/44.44% cake. But then, that’s harder to remember. From the box of A.D. from Lutz, Florida, by way of Pennsylvania in the 1940s, and originating in Ohio in the 1920s. A more traditional cake than Number I. The traditional treatment given to fresh mackerel in Japan. Fresh whole milk, so called to distinguish it from sour milk.